The Canadian Grand Prix is worth the usual 25 points for the winning driver and team, but performances across the weekend will have a significant effect on the results of seasons to come. Engines will be a particular focus in Montreal, and not just because the Circuit Gilles Villeneuve is one of the most power-sensitive circuits on the calendar. With round seven representing the third-way mark of the 21-round season, the North American race has long been pencilled in to feature the introduction of the first power unit upgrades for the year. But the most important battle in the power stakes won’t be between Mercedes and Ferrari. Instead the sport’s most maligned engine builders, Renault and Honda, will be of greater interest. The travails of the French and Japanese companies have been heavily scrutinised in the modern turbo-hybrid era. The former, despite powering Red Bull Racing to four world titles between 2010 and 2013, has fumbled its way through unreliability and a lack of power since the current formula’s introduction, but to date its blushes have been spared by the latter, which has operated at a comically low bar since its 2015 return to Formula One. But the order is no longer as established as it once was. Honda, having endured a humiliating break-up with McLaren — though the English team’s lack of performance this season is putting paid to some Woking-backed myths about the relative performances of the former partners — has turned a corner and is closing the gap to Renault. This should not be entirely surprising. As outlined here during the preseason, Honda’s design reset in 2017 made it look more inept than it really was in its final year with McLaren, plus Toro Rosso’s approach has helped ensure that both sides of the relationship are getting the most out of each other. There is of course a third element: motivation. Honda is not motivated only by the desire to perform; it is spurred on too by the desire to rehabilitate its reputation, and the only true way to do so is to rejoin the frontrunners. Conveniently enough for Sakura, Red Bull Racing, one of the exclusive club of three race-winning teams this season, is in the market for a power supply. Just as Honda’s woes are well chronicled, so too has been the long-running sourness between Red Bull Racing and Renault. Similar to McLaren, RBR believes it has the chassis to be a championship contender if only it had the power unit to match, the principal difference being that race victories lend credibility to its claims. Red Bull Racing’s problem, however, is that it has had no other options. When it tore up its contract with Renault in 2015, neither Mercedes nor Ferrari was prepared to offer it engines and McLaren blocked Honda from entering into any agreement, leaving it to return sheepishly to Viry-Chatillon. But still keen to break away from its French ball and chain, the opportunity to partner Toro Rosso with Honda to assess the Japanese’s company potential was not to be missed, and on early-season evidence it could prove to be an inspired decision. Honda is of course not yet up to Renault’s level of performance, never mind that of Mercedes of Ferrari, but potential between now and the end of 2020, after which the current power unit will be replaced, is key, and pre-race suggestions are that Honda will be bringing more significant gains to Canada than Renault. Red Bull Racing chief technical officer Adrian Newey revealed earlier this week that he expects Renault to bring one per cent more power, which is around only 10 horsepower. According to Autosport, Honda is targeting an upgrade worth 27 horsepower. Moreover, for perhaps the first time in Honda’s current F1 foray it isn’t the least reliable supplier, as saliently illustrated by Daniel Ricciardo sitting on the precipice of grid penalty this weekend for using more than his season’s allocation of Renault power unit parts. Honda, on the other hand, has kept a cleaner sheet, with the unscheduled revision of the turbocharger and MGU-H after the Australian Grand Prix the only mark against it. Red Bull Racing flagrantly ignoring Renault’s hard 15 May decision deadline — Renault is reportedly contractually obliged to supply the team if required until 2024 under a Bernie Ecclestone-era deal anyway — is a sign of which way the team is leaning. “We regard it as a positive thing,” Honda motorsport boss Masashi Yamamoto told Autosport. “Giving us time means we have time to consult more. 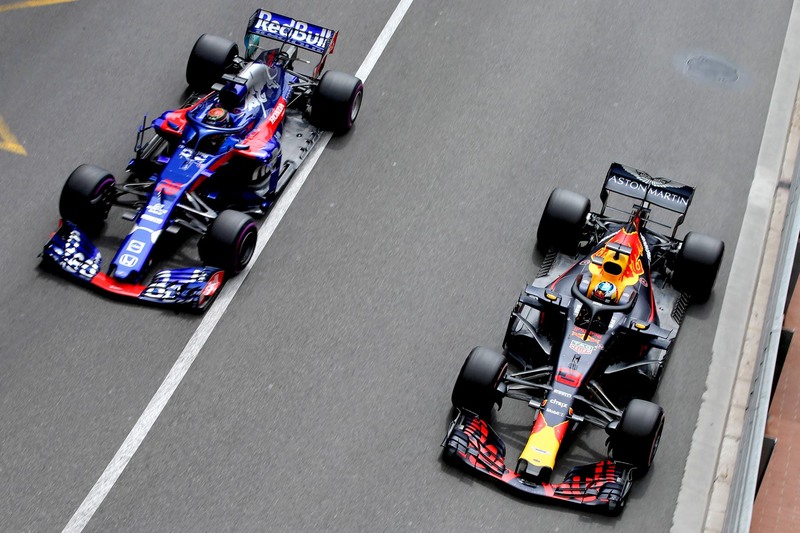 With Red Bull Racing reportedly setting itself a deadline for the end of the month, Honda might finally have a route back to Formula One’s upper echelon, and it all comes down to this weekend’s Canadian Grand Prix.